A good example to describe foreshortened form is when a person points their finger directly at you. From your vantage point, his arm is not seen lengthwise, as it would be if it were resting by his side. Instead, the arm is visually compressed between the hand and the body. The distance between the two appears smaller and the arm takes up less visual space as the position relates to your view. This is because bulk of the surface planes of the arm are now running perpendicular to your viewpoint. Foreshortening is a critical part of drawing three dimensional form. Today we are going to define foreshortening and examine how it works. Let's start with a simple box. To the right is an image of a square and rectangle. These two shapes represent two sides of a box. In both cases we are looking at the the side of the box directly. There are no other sides visible and no need to foreshorten anything because we are not looking at more than one side. This next image shows the box drawn in three dimensions. The box in the image has height, width, and depth. Here, two sides and the top of the box are visible. This box is drawn in perspective and this is our first image where foreshortening occurs. The visual depth of the sides and top have been reduced to allow the box to visually recede in the image. To make the effects of foreshortening a bit more dramatic, we can flip the box onto its side, so that the long side of the box is on the ground. If we position the box so that no side is directly facing the viewer and draw it in a way that it appears three dimensional, we will need to reduce the visual space along the long side of the box. Notice how the visual distance of the side of the box on the right is shorter than the box on the left. 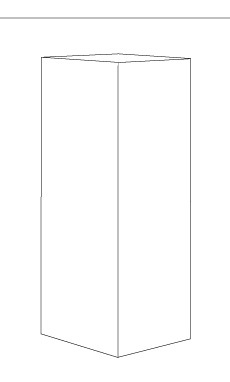 The two boxes are actually the same size, so the sides are the same length, but one side appears more compressed because it is running at an angle closer to being perpendicular to the viewer. Foreshortening in drawing or painting is the reducing of the visual distances of surfaces not directly facing the viewer to create visual depth. The box example demonstrates foreshortening well enough, but rarely do we stick to drawing such basic forms. Let's look at an example related to something we might want to draw. For this let's go back to the arm. 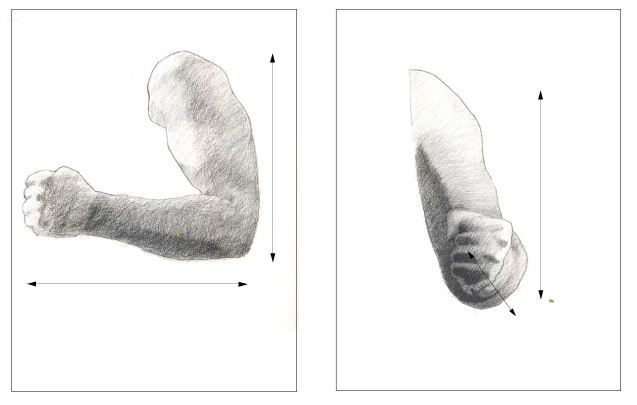 The following drawings show the arm in two positions from two vantage points. 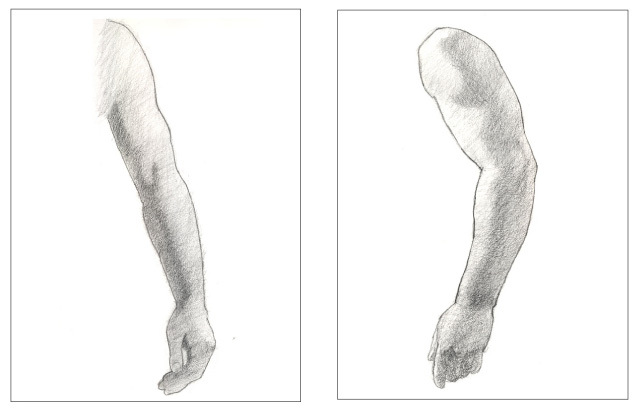 This will be to illustrate the difference between a foreshortened arm and one that is not. The first example is of the arm as it is hanging to the side of the body. In the drawing the forearm is not foreshortened. 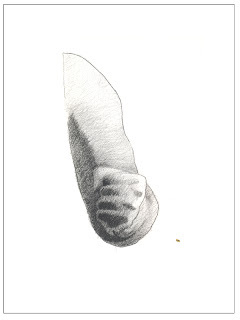 In the next images you can see that the lower arm has been raised and the hand curled into a fist. The hand and the lower arm have moved towards the viewer. This means that the forearm now occupies a space that is compressed from that vantage point. The arm then looks compressed and is foreshortened. 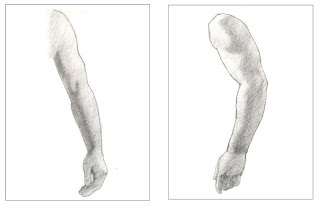 The same images of the foreshortened forearm, this time including lines representing the visual distances of the upper and lower arm. The visual distance of the upper arm remains the same from shoulder to elbow because it has not moved. The distance of the forearm compresses in the front view to show that it is coming forward in the image. To foreshorten form is to create visual depth. It is a devise that is used along with other guides and tools for working out perspective.